NVIDIA reiterated its market position as the dominant graphics card maker at the NVIDIA COMPUTEX 2018 press conference. NVIDIA CEO, Jensen Huang took to the stage to give a quick brief of what all NVIDIA has achieved over the last year. The highlight of the press conference was the NVIDIA Isaac, a robotics platform to power autonomous machines by bringing together NVIDIA’s AI prowess to enable robots for manufacturing, logistics, construction and other industries. NVIDIA Isaac is basically three things put together - The Isaac SDK, Isaac IMX and Isaac Sim. 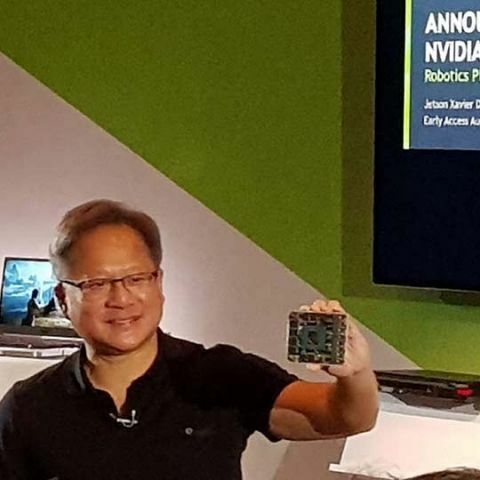 And at the heart of the NVIDIA Isaac lies the Jetson Xavier which is a computer designed solely for robotics applications. The Jetson Xavier is an amalgamation of different processors that talk to each other simultaneously. All of these processors put together, the Jetson Xavier has 9 Billion transistors and delivers 30 Trillion Operations per Second. NVIDIA equates this to more processing capability than a workstation while using a third of the energy of a lightbulb. Essentially, the latest GTX TITAN graphics card is barely faster than the Jetson Xavier. Coming to the individual processors that make up Jetson Xavier, there are six types of processors in total. There’s Volta Tensor Core GPU, an eight-core ARM64 CPU, an image processor, dual NVIDIA deep learning accelerators, a vision processor and a video processor. Put together, these processors can run a multitude of tasks using dozens of algorithms in real time. The Jetson Xavier can perform sensor processing, localisation and mapping, vision and perception, odometry and path planning. This new platform comes packed with all the compute power to let an autonomous machine run on its own with little external interaction. The Jetson Xavier is the hardware part of the entire solution. The other half i.e. the software portion comprises of three things - Isaac SDK (collection of APIs and tools), Isaac IMX (Issac Intelligent Machine Acceleration applications, a collection of Robotics algorithms) and Isaac Sim (highly realistic virtual simulation environment to help train the autonomous machines). Jetson Xavier along with these software libraries can bring a level of AI computing power to the edge that was until now not possible. The NVIDIA Jetson Xavier developer kit will be priced at $1,299 and will have an early access programme starting in August 2018.